© 1979, 2011, 2015 By Bob Litton. All Rights Reserved. NOTE TO READERS: Okay, this is your lucky day, folks!!! The editorial below is the last old-timey piece I plan to transport into this blog. Oh, I do have three others left; but they are truly the dregs, and I don’t plan to publish them unless I get into a really bad spot. This opinion piece on our right and obligation to vote of course concerns a subject which we have read and heard preached about over and over ad nauseam. Yet, many of us Americans have a strangely hard time taking the sermons to heart. It really bothers me that such large percentages of Middle Eastern populations brave threats of violent death in getting to the polls yet turn out in large numbers anyway, while our own percentage level is, election after election, pitifully low. Well, this editorial is slightly more than an answer to those issues. It at least offers one solution. Give it a try. The Ward County commissioners Monday estimated it cost the county taxpayers about $4.25 per vote to hold the recent state constitutional election. There are two ways to look at that figure: (1) if more people had voted, the cost per vote would have declined proportionately; or (2) if there had been no election, then there would have been no cost at all. As nondescript as it was, the election was made necessary by our state’s arthritic constitution, so that eliminates the second subjunctive clause above. We are therefore left with the first possibility: the more who participate, the less expensive is democracy. Were it not for the fact that those who voted were as much penalized by the expense as those who did not vote, I would sit back and chuckle, albeit slightly ruefully, that the ostriches were being tormented at least a little by the sand in their eyes. The situation reminded me of an article in Life magazine, part of a series on ancient Greece, that I had read as a boy. Specifically, a certain illustration in one of the articles has remained vividly etched in my mind. The water color scene represented two Scythian archers, whom the Athenians used for policemen, walking down the street with a rope dipped in red paint stretched between them. In front of them scurried some Athenian men, glancing over their shoulders with worried visages at the red rope and clutching their garments about them. The caption explained that the citizens were late to a meeting in the agora where community business was carried on. Should they arrive with red paint on their persons, they were liable to be fined. Now, ancient Athens is the place we ordinarily associate with “the cradle of democracy”. And “democracy” for most of us connotes “freedom”. Moreover, freedom has grown to be so extensive an idea in the United States that we also mean for it to include the right to not participate in elections and other activities by which that very freedom is supported. The Athenians obviously had no use for a slug-a-bed’s notion of democracy. The existence of their city-state was too precarious to be subjected to indifference. Frankly, I wish we would fine ourselves a good deal more heavily than $4.25 for our sluggardly voting habits. You might retort that some of us who are legally entitled to vote are intellectually not capable of voting rationally and that such persons should not be forced to introduce their ignorance and emotions into the general consensus. I offer two responses to that argument. First, there are already a lot of ignorant and emotional people who feel quite at ease offering their two cents worth of clamor to the “general consensus”, which is why our national conventions usually appear more like rock-n-roll shows. What democracy relies on, in fact, is that the more idiots there are trying to think, the greater the likelihood of some sensible idea arising like a bit of articulate smoke out of the combustion of their interchange. The second response is that if a person can be held responsible enough to drive an automobile or possess a charge account, then he or she should be considered rational enough to vote sensibly. These would, in fact, be quite simple ways of determining both who is enjoying the most free aspects of American life and who should be held most responsible for seeing that it is maintained: holders of credit cards and driver’s licenses. I would propose that all of us with either a credit card or a driver’s license be fined, and heavily, if we did not vote in an election, unless we could prove our inability to reach the polls at the proper time. Our cornucopia of freedoms should not include indifference. NOTE TO READERS: This column that I wrote 35 years ago doesn’t require much in the way of a preface except to note one odd bit of content in the sixth paragraph. There I mention the sound of a chattering TV set, and the Big Bend is in a very remote area of the state—about two hundred miles away from the nearest TV reception capability. That wouldn’t have mattered if the campers could have brought a VCR with them, but this event occurred in 1972: Sony didn’t introduce Betamax until 1975, in Japan, and JVC didn’t put VHS units out until the next year, also in Japan. The only nearly plausible third alternative I can imagine is that a TV station in northern Mexico might have been accessible. If not, then all I can suppose is that the family in the camper were listening to an audio tape of some radio show. Whatever! I am leaving the sentence, true or not, in my little essay primarily because it adds color. Pulling into my driveway late one night last week, I saw a skunk standing by the side of the house. He saw me, too, and raised his tail menacingly as I got out of the car. However, after sensing I was chicken, he lowered it again and slipped through one of the holes in a cinder block at the base of the house. The incident reminded me it’s high time I went camping again in Big Bend. Here I am, only 180 miles from mountain and canyon country, and I haven’t been down there yet. In fact, my one and only journey to Big Bend was the one I made all the way from Dallas back in 1972. Not having any camping gear of my own, I borrowed a bedroll and a picnic awning from some friends. (The awning was to serve as my tent.) Then I cleaned out the few canned goods in my pantry and headed south. For three days and three nights I “roughed it” in the Chisos Basin camp, where they have all the amenities like piped water and barbecue grills. There I placed my “tent” between some boulders and a couple of pine trees. During the day I took little hikes. In the evenings I sat at the edge of the camp ground which sloped sharply downward into a canyon. From my vantage point I watched wildlife in a wilderness habitat—three buzzards circling around looking for dead rabbits. Behind me I could hear a television set chattering in a trailer, a guitar being strummed up the road, and children riding around on their tricycles. His comment, snide though it obviously was, achieved its intent. That night I piled dirt and rocks around the gaping bottom of the tent. Then I fastened the front flaps as thoroughly as I could, considering they weren’t made to be fastened. Not having a watch, I couldn’t tell what time it was when I was wakened by a nudge behind my knee. The promised rattler! I lay there staring at the wall of the tent in the pitch dark. I dared not flick a muscle. How would I know if and when it would leave? How many hours of the night were left? Then I felt it again, only now it was a sniffing touch at my ear lobe. No snake. A coyote? A skunk? I lay still perhaps 15 or 20 minutes more—until I could stand it no longer. Even if it meant a load of skunk stink in the face, I must end this awful tension. I must turn over. There was nothing there. I began to wonder if I had dreamed it. No, the first nudge might have been explained that way, but the ear lobe business had happened while I was more than wide awake. With a flashlight I looked for tracks or other evidence of the animal’s nature. Not even Geronimo could have found paw prints on that rocky ground! Next morning I pulled up stakes (figuratively speaking) and set to folding up the awning. However, the night’s deposit of dew glistened all over the canvas, and I hated to fold it up wet. I spread it out over the boulders, pulling it this way and that, trying to arrange it so that the maximum of morning sunlight would reach it. But the morning clouds kept intercepting the sun’s rays, and even when the sun shone full upon it there didn’t seem enough heat forthcoming to dry up a single dew drop. An elderly couple who had just arrived that morning were unloading their camp gear up the road. Although some distance away, I could distinctly hear the woman’s voice in the crisp mountain air. I like this portrait photo (even though I didn’t take it) because of the extra-dude style dress and mustache, and because the poet looks both glad and anxious as he is about to step out onstage and present his compositions before a roomful of mostly strangers. NOTE TO READERS: Next Friday and Saturday (February 27-28), Sul Ross State University here in Alpine will host its 29th annual “Cowboy Poets Gathering”. There are a few other similar gatherings, notably at Elko, Nevada, and Lewistown, Montana—both of which antedate Alpine’s by a year or two. Although I claim to be a poet, I have never attended any of the several recitations and musical events associated with the event, which has drawn attendees from around the world. Over the past decade, however, I have gotten up before dawn to go down to “Poets Grove” each of the two mornings to chat with the cooks and drink some of the coffee prepared over one of several wooden fires in holes dug in the ground. By the time the breakfast of scrambled eggs, sausage, biscuits, gravy and orange juice is ready, a very long line of hungry participants and attendees has developed. My early arrival entitles me to a place at the front of the line. Back in 1997, while I was a reporter for the Alpine Avalanche, I wrote the following article. One of my interviewees was then-Ward County Judge Sam Massey; I had known Sam before he became a county official, when I was editor of the Monahans News. The other locals in the article I knew only on a greeting basis. So, you are probably wondering why I never went to listen to their poems. Well, the answer is two-fold: (1) although when I was a young boy I had wanted to grow up to be a cowboy, somewhere during my maturation I resigned myself to the fact that I lived in the 20th and then the 21st centuries, while the cowboy fantasy I had fostered belonged to the late 19th century; and (2) I associated (perhaps erroneously) all cowboy poetry as being of the same caliber as that composed by Robert Service and Edgar Guest, and I wasn’t interested in gagging. But those folks enjoy writing it, reciting it and hearing it…and they have a right to enjoy it. Perhaps you will, too. Anyway, please enjoy the article below. What makes a cowboy — or cowgirl — poet get involved in writing and recitation? Since the annual Cowboy Poetry Gathering is coming up this month, we decided to ask a few of them for the genesis of their interest. Some got into poetry as an offshoot of their music interest. That is certainly true of Alpine’s Mike Stevens and Karen McGuire. 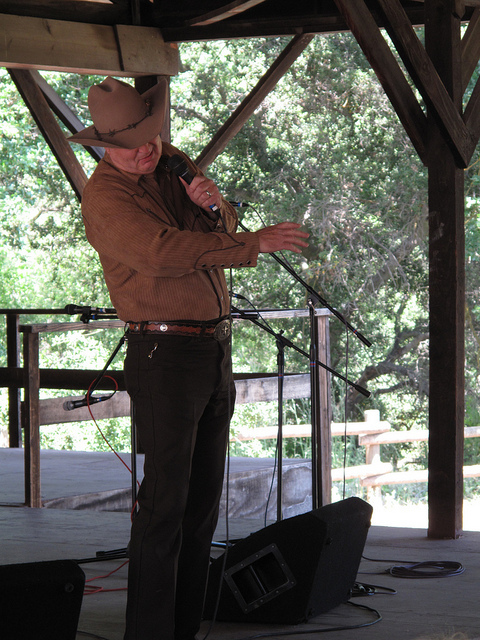 “I got started in cowboy poetry because I moved here in ’90 and it was happening,” says Stevens. “Mostly, being a musician, I got in just to play. I realized some of the songs I was doing were old cowboy songs instead of folk songs, especially Blue Mountain. After I sang it here, Buck Ramsey came out with an album with the title song My Home It Was In Texas — the first line from Blue Mountain. The song’s really about a mountain in Utah — pretty old, obscure song. “The ‘Gathering’ was just another musical, fun outlet. After I had been around it a while, I wrote a poem. Actually, it was easier than writing a song because you don’t have to write the music. Although Stevens has composed several songs over the years, he’s written only two poems thus far. “I wrote about my first experience on a big ranch — the o2 — shortly after I moved here,” he recalls. “The o2 was pretty wild then — wild cattle. “It was a new experience for me because my background had been in arena roping and horse shows. My father being a cowboy, I grew up roping calves, but they were in a pen. We only had a hundred and sixty acres, so it wasn’t like you gathered them.” That first poem was called o 2 A Maverick. “At that time there were a lot of mavericks down there spread over about two hundred and seventy-five thousand acres,” he says. McGuire says she usually recites about three poems a session. Three of her favorites, which she will probably recite at this “Gathering”, are Just Another Rider, a poem her mother wrote about her own teenage years near Big Lake; Vaquero Puro, a poem by Chisum about Ben Morrow of the McIntyre-Morrow Ranch; and an untitled poem of her own about the stick horse and the pony of her childhood. 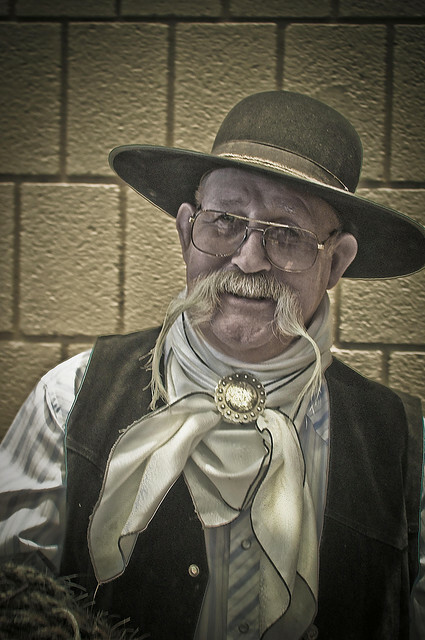 A cowboy poet with more experience than either Stevens or McGuire is Wickett rancher Sam Massey. He came to Alpine on business in 1987 and saw the sign about the “Gathering” in front of Sul Ross. “I stopped in to see what they were doing and enjoyed it,” he recalls. “I wrote a poem on the back of an envelope on the way home and said, ‘I can do that!’ and I’ve been doing it ever since. It’s a wonder to me, A mystery, you see, Why stock trailer lights won’t stay lit. We patch ’em with wire, Change bulbs then in ire, We watch ’em burn bright when they sit. I like this photo, despite the hidden face of the poet, because it appears to show him in a dramatic gesture, like he’s really got his heart into the performance. Also, the trees and bright sunlight in the background resonate as a Texas scene, although it could be in New Mexico. Some warnings to readers: This is another column from my much-diminished pile of ancient columns and feature articles. It dates from November 1981. Another interesting facet to this gem is that it illustrates how inflated one’s perception of his own stature and domain of authority can become if he lingers in any position or place too long. < Claiming that Dallas is Ward County’s north forty!!! Bosh!!! Presuming to exhibit how a lady’s coat needs cleaning!!! Pish!!! > Oh well, I was young then…and handsome and wise. I need to alert you to the fact that this column is about 1,300 words long, so don’t feel disloyal if you begin to yawn and want to wander off to your bed or couch. I tried to make the piece engrossing and exciting, but it’s not a cliff-hanger mystery tale, people. My genius can only accomplish so much. However, you won’t offend me at all if you don’t finish perusing. Just rest in your nightmares. The following column is rated R. It is recommended for adult reading only. It should be read only at night. Well, I finally got off to Dallas for a brief vacation last weekend. I suppose you’re wondering why I’d include Dallas in an “Out in the county” column. It’s this way. I’ve begun to look at Dallas as sort of the “north forty” of Ward County. That’s because every time I fly up there I see someone from Ward either going to or returning from Big D. This time it was N.R. Bragg, a retired gentleman who lives out in Thorntonville. Also, my traveling companion on the trip was Tom “Delegate” Murray, recently elected president of the Ward County Democrats. In Dallas, I gave Tom a whirlwind tour of the “cultural pubs” along Knox Street, and then he went on up to Denton while I visited family and friends in the Metroplex. One strange new phenomenon I noticed along I-35 was a motel called the “Non-Smokers Inn”. Later, my mother showed me a Bob Greene column explaining the innovative inn. It has apparently just opened up, and the owner — who had recently lost some friends to emphysema — had sworn not to allow any smokers, either registrants or employees, to stay there if they smoked a single cigarette. Even the construction workers, Greene noted, had had to be non-smokers, a requirement which no doubt slowed the construction schedule. During my brief sojourn in the big city I was just in time to attend the final reading at SMU’s annual literary festival. At one of the entrances to McFarlin Auditorium, I encountered old friends, an English professor and his wife, who were greeting people at the door in their capacity as two of several departmental hosts for the week-long event. I had wanted to sit in the back so I could make a quick exit if the mood struck me, but they insisted I sit with them and piloted me up to the fourth row. Featured reader for the evening was Donald Barthelme, a frequent contributor to New Yorker magazine, so you can imagine what the pieces he read to us were like — short, comical, sophisticated. However, I must have molted off my cultural skin during two years in West Texas, because I sat there like a cigar store Indian bemusedly examining the brown tweed coat on an elderly lady directly in front of me. Two long strands of detached hair were lying along the right shoulder of the garment, and I was mightily tempted to remove them for her. But, I feared she might jump like Little Miss Muffet or turn about indignant at my officiousness if she happened to detect my action. Then again, she might never know. The issue was resolved when Barthelme began his last reading. The theme of it had something to do with chronometry, I believe, and each paragraph ended with an oft-used barnyard phrase “…and all that s—!” The lady with the hair-littered coat and her male companion of an equally advanced age, after hearing Barthelme’s selection nearly to its conclusion, arose and left the auditorium. The author, it seemed, had wrenched my opportunity to do a good deed that night right out of my grasp. Another event which I consider historic (although I missed it by three or four weeks) was the demise of Henry’s Café on Hillcrest across from SMU. Saturday morning, I walked across the campus, fully relishing the prospect of a breakfast such as I had enjoyed with musician friends at Henry’s virtually every Saturday for many years. I was shocked upon finding instead a remodeled building with a sign over it saying “Dixie’s Hamburgers”. What Dixie’s called a breakfast was a scrambled egg and sausage pressed between the halves of an English muffin. Time occasionally marches with a rather abrupt tread. Back at Midland-Odessa Airport, Tom and I spent a good while locating my dust-covered Pinto. It was already dusk when we drove out onto the highway, and I said, “Sure glad you waited to come back with me, Tom. It’s a long dull drive between here and Monahans, and having you to talk with will help me keep awake.” By the time we reached the caprock, Tom was slumped in the carseat — asleep. At the Wickett Post Office, I met Postmaster Don Bowen, who has served in his present position ten and a half years, although he started with the post office in Monahans in 1965 and still resides there. Bowen is an out-going sort of fellow. His favorite leisure time activity is bowling. Several league trophies are prominently displayed in his post office. “I enjoy the fellowship,” he told me. “I enjoy it when I win and I enjoy it when I lose.” The postmaster informed me he is putting mail into 330 rented boxes, about 100 more than when he came to Wickett ten years ago. Twenty of those boxes belong to businesses. NOTE TO READERS: Now this feature article, from the March 7, 1996, edition of the Alpine Avalanche, really is dredging up an historical event: the discontinuance of a nearly 90-mile bus ride for school students residing in the southern-most tip of our huge county to schools in Alpine. The cessation of that barely endurable round-trip, in fact, was so long ago that I hesitated a while before deciding to present it to your most-tolerant eyes, dear readers. What I believe preserves its readability is the humorous anecdotal content as well as the way the students coped with their daily torture. I salute those now-adult heroes and heroines! Next fall some high school students residing in Terlingua no longer will get up way before dawn to make the two-hour bus ride to Alpine. Melody Clarke has been driving the Terlingua bus route for nearly five years. Her husband, Robert, accompanies her as monitor. The Clarkes live in Terlingua and keep the bus there overnight, so they actually have to make the 89.7-mile trip only twice a day, AISD Transportation Supervisor Larry Taylor points out. “We start out at 5:40 with twenty-two kids in the elementary school in Study Butte,” says Robert Clarke, “and we get here at the elementary about 7:40 — give or take two or three minutes.” Of course, at 6 a.m. the claims of sleep have not surrendered. “The students will have their blankets and pillows with them,” says Taylor. On the way the Clarkes pick up one student at Gate 7 of Terlingua Ranch, a second at the main entrance, a third at Black Mesa, three more at Elephant Mountain Wildlife Preserve, and the rest at ranches along the way—the last student one and a half miles south of Alpine. Besides the highway distance itself, some students live a few miles from the bus stops on ranch roads. However, Alpine School Supt. Wayne Milligan points out that those parents who have to drive their children two miles or more to reach the highway are reimbursed for mileage by the state. Even with the high school built in Terlingua, the route will still be a lengthy one, since the Alpine ISD extends all the way to a point just south of Pack Saddle Mountain and north of Hen Egg Mountain—roughly two-thirds the present route. Also, some students, especially high school seniors, might elect to continue at Alpine, which they may do if their parents pay tuition, says Milligan. Of the thirty-two now being bused, five go to Alpine Elementary and the rest go to the high school. Fortunately, during the past two years only two mechanical problems have happened along the Terlingua route. “Last year there was trash in the fuel tank,” Taylor recalls. “We ended up having to change out the tank.” He sent another bus to pick up the kids, and they were about an hour and a half late. “Actually, they were going home,” Taylor notes. The bus is equipped with a cellular phone, but there are areas along the road where its range is limited because of the mountains. In those cases, the Clarkes have to stop a passing vehicle and ask the driver to go to the nearest phone for them. If they are lucky, that passing vehicle will be the Border Patrol or the telephone company, which will have a radio telephone. The most memorable agitation wasn’t caused by the students, however, but by Melody Clarke. “About three or four years ago there was a family of skunks crossing the highway, and I ran over them,” she recalls. “Their skunk smell permeated the bus, and the other kids at school stayed away from the bus kids, accusing them of bathing in skunk perfume. The smell didn’t stay in the bus, and the blankets aired out okay, but they had to throw away about three pillows. “The kids were mad at me at the time, but we laugh about it now,” she says. NOTE TO READER: Got an email from a friend the other day—a rather pushy friend who is always urging me to do this or that! Anyway, this time he said I need to write something for Valentine’s Day. He apparently never read the three I wrote between January 31 and February 14 of last year. If he had, he would recognize that I have exhausted the subject of romantic love. Yessiree! I have put the cap on the topic in this blog! Well, almost. There was one small piece I wrote back in 1980 which might gently remind my readers of the day’s significance without indulging in hyperbole or grandiosity. But this has to be it; I am going to leave future Valentine’s Days to other, younger writers with a little more libido left in their veins. And this post I intend to schedule just for one day (although it will remain available after 2/14), because I had another, more entertaining post already scheduled before my friend interrupted it with his request, and I had to slide it over a day. Yes, I can hardly recall what “being in love” was like, although I do remember the physical embraces and the nighttime songs to the moon between year 15 and year 25. An old man has to be kind and smile indulgently at those memories—the emotions of which he now attributes to the aroma of the perfume his sweetheart wore: Arpege. I swear he will never feel that way again—not unless Jeanne Crain or Grace Kelly returns for him. Valentine’s Day has always been one of my favorite days. No interminable prelude like Thanksgiving and Christmas. No over-indulgence like New Year’s Day and the Fourth of July. No foppery such as attends Easter. The worst thing you can say about Valentine’s Day is that we sometimes get a little mawkishly sentimental then. But it’s a great day. When I was in grade school I used to wonder why it wasn’t a real holiday—one for which you got out of school…legally. But shortly I realized that if we got out of school we wouldn’t be able to give each other cards on Valentine’s Day, and that was all the day was for. I was always one to analyze the Valentines I received. Of course, the expected thing to do was to give a card to every girl in the class, maybe even to everybody in the class. But you could always pencil in something a little special on one or two cards and expect like treatment in return. I always looked for such signs. NOTE TO READERS: The column below is another of the “treasures” from my historical files, written while I was editor of the Monahans News. Even though the debate between Walter Mondale and Ronald Reagan in 1984 is itself now simply historical, the remarks I made in pondering it and political debates in general are still relevant, I believe. Of course, changes in style and content of debates have taken place since then. Much of the credit—or blame—for such changes can be laid at the doorstep of media innovations. If President Barack Obama’s recent State of the Union address before Congress (and the world) is any indication of what we can expect this upcoming political season, then we are in store for a virtual immersion in Powerpoint-style graphics and emotion-driving clips. I already almost shudder at the prospect. Nonetheless, I believe we need to insist on debates and do whatever we can to make certain they are kept as broad, civil and on-point as we can. That is not going to be easy, but it is essential if we are to retain our democracy. By the way, is there any time now that is not a “political season”? I have been taping the presidential/vice-presidential debates, mostly for historical reasons, but also because I catch parts the second time around that I missed the first. Admittedly, I’m partisan, but I can tell—and wince—when my side receives a verbal jab on the jaw. And I admire any four persons who can get up in front of a nationwide TV audience of about 80 million people and respond on their feet to incisive questions whirled at them by a group of three or four top journalists. These debates have been the subject of much discussion by newspaper and television commentators. Debate and voice coaches were interviewed immediately after the debates about how each participant had done. Video clips of Walter Mondale’s convention speech and his performance during the debate were compared to illustrate the effects of voice-coaching. The President’s age became a campaign issue because of his faltering for words. Vice-President Bush tried a little too hard to appear ebullient and ended up looking spasmodic. Geraldine Ferraro, presumably trying to compensate for what her critics have described as “aggressive stridency”, over-compensated and ended up looking as though she were trying to escape from a strait jacket. Regardless of their individual performances, the very fact that those four could stand at their respective podiums and parry and thrust as they did was a commendable exercise I wish we could see more of. To me, the most noteworthy aspect of the whole scene was the more careful claims and counterclaims. Each had to try to be a little more circumspect than they are out in the heartland, where they speak primarily to supporters essentially uncritical of whatever they choose to say. Certainly, a few outlandish statements were made, but at least the opponent had his or her chance to respond to them right there minutes later. Nevertheless, the validity of campaigning through debates has been questioned. Some say “these debates are not real debates” and others say “having a Rolodex for a brain doesn’t qualify one to be president”! I honestly don’t see where these critics’ minds are! For sure, the presidential “debates” are not debates in the scholastic sense, nor can they be. In a scholastic debate only one question is to be resolved. But we can’t afford to have our candidates spend all their time on one question; there are too many issues that need responses. Moreover, unlike a scholastic debate, the tool used is not always reason but appropriate emotion. As for the capacity for reeling off facts and figures, nobody is asking the candidates to snow them with such. At each juncture where the candidates resorted to a long succession of numbers, they lost the audience and, for that brief period at least, the debate. Just as the questions were for the most part thoughtfully composed by the journalists, the queries should not have come as any great surprise to the candidates. Moreover, real questions on the issue, as they are based upon principles, can be answered on the basis of principles, concisely and honestly, and numbers seldom need be resorted to. While it is true that a good debater doesn’t necessarily make a good president, it is also true that a poor debater is even less likely to make a good president. After all, most of these politicians’ jobs involve trying to persuade someone to their point of view. If Reagan was really “toe to toe” with Gromyko during the latter’s recent visit to the White House—as Reagan’s men would like to have us believe—surely being able to articulate and resolve differences was the key to the whole conversation. A president needs to be able to think on his feet and talk on his feet. In political debates we have practically our only opportunity to hear candidates discuss the same issues at one place and time. Too often out on the hustings, a candidate will discuss only the issues wherein he has the stronger case. Without his opponent at hand to refute him, he encounters only occasional close questioning from some astute citizen. Of course, there is the “real politick” aspect of debates. The incumbent has the most to lose. Once, while I was urging one of our local representatives to agree to a debate with his challenger, his response was: “I can draw a crowd. Why should I draw one for him?” And it’s true that politicians at all levels invest a lot of other people’s money as well as their own into their campaigns. They also work long hours traveling over their district to meet the voters, so why should they give their opponents’ any leverage? While I concede that these are true facts of life for politicians, I also reply that the voters’ interests are being ignored in that line of reasoning. As far as I am concerned, debates should not be optional but mandatory.